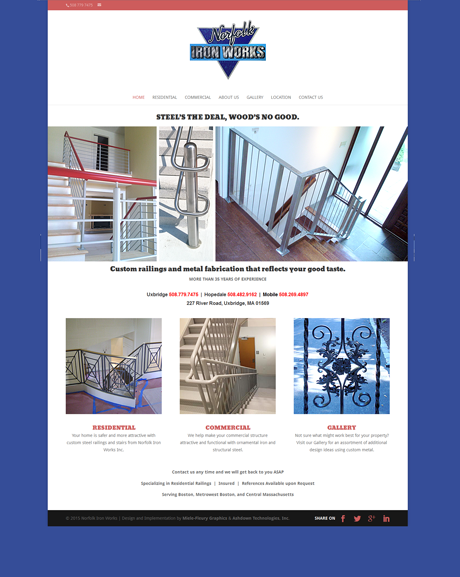 For Norfolk Iron Works our goal is to showcase the range and quality of their work. Norfolk Iron Works does ironwork across a wide range of applications, from construction framing to both commercial and residential and custom work, to fine restoration and recreation of vintage and historical iron work right in the heart of Boston — in areas legendary for the beauty of the streetscapes including iron work railings and balustrades. The new site is fully responsive, and is flexible for adding new projects to be featured as these are completed. At the same time, we created a new full color business card to coordinate visually with the new site. Visit the Norfolk Iron Works web site.